BrainstormOverload - BrainstormOverload - Small design studio. Big ideas. Our work is highly creative but simultaneously grounded in reality. Our new logo represents the synergy that comes when both left and right hemispheres are working together. Sticking to one or two colors gets old pretty quickly so we selected two spectrum’s. Warm colors for Cindy – cool colors for Todd. 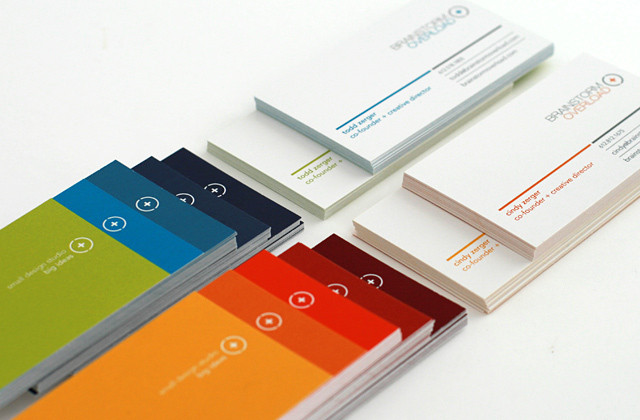 Business cards are always at risk of being as dull as…well, business cards. We’ve spiced our new cards up with our full color spectrum. It’s subtle but the idea is to hand the recipient a carefully designed card that does the required job but also throws in a dash of the unexpected because that’s what working with us is like.